Looking for a way to help your child monitor stress/ tension and to increase body awareness? Biodots are a great way to begin. Biodots measure stress in the body by monitoring blood flow. Put them on the back of the hand to sense body temperature. The more blood flow through the body, the more expanded blood vessels, the less stress. The less blood flow, or colder body temperature associated with blood vessel restriction/contraction, the higher the stress response or greater level of stress the individual is experiencing. The dots change color depending on the body temperature. A color coded key accompanies the dots and explains the color associated with each stress level. These little dots are not only fun, but are an excellent biofeedback visual tool to help children monitor their stress response. As you repeatedly use these dots at varying stress levels, children begin to gain a deeper understanding as they tune into the physical sensations that are going on as they are feeling stressed or tense. This enhances mind/body awareness. To get you started, visit the following website: http://freebiodots.com/ to receive 25 free biodots (no shipping!). Show your child the biodot color key and explain how they work. Begin by measuring a moment where your child is feeling calm and collected. Next, wait for a time of tension, measure using the biodot. Practice a calming tool, then re-measure to compare. 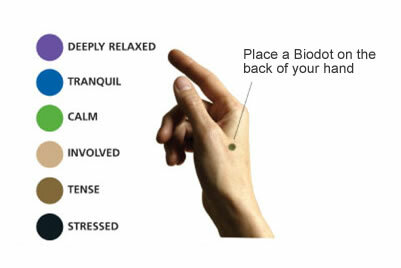 Use the biodots to measure the effectiveness of the calming techniques you are practicing and discuss why or why not the response was obtained. Maybe it will help to determine which tools work better for your child. Practice some of the activities found on this site, and watch the impact! I remember mood rings when I was young and they were fun! The dots make sense to me as they would provide a more accurate read when placed directly on the skin. With autistic children and adults responding better to visual stimulation this could be a beneficial tool.